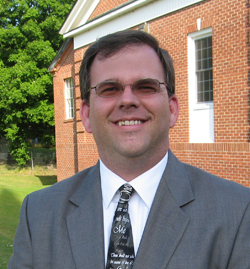 Hi!, I'm Robbie Gibson, Senior Pastor for East Sanford Baptist Church. I want to thank you for visiting our website. I hope that you have found this site to be helpful to you. I began pastoring here on January 1, 2010. This is the third church in the Moore/Lee Counties area that I have pastored. I grew up in West End, just about 30 minutes from here in Moore County. I started preaching at the age of 12, but fell away from God and the church for a time after reaching the age of 18. I am thankful that "nothing can separate me from the love of God." God continued to pursue me and call me back to Him. Finally, in 1995, in returned to God's house and His Kingdom plan for my life. I have been serving His church since 1996, when I started as Youth Minister of First Baptist Church of Vass. From there, my wife and I started an independent youth ministry (www.nowministries.net) and helped to start a new church, Open Arms Community Church, in the Vass area. I served as pastor of Open Arms for 5 years before moving back to my home church of First Baptist Church of West End, where I served as their pastor for another 5 years, until December 31, 2009. I have taken undergraduate religion courses at Campbell University and recently began working toward my BA in Religion through Liberty University. I hope to graduate in May or December 2014. Visit my blog at www.robbielgibson.com.